The Hawaiian Islands offers five beautiful islands on which to hold your next incentive program or conference. The destination islands are: Maui, Oahu, The Big Island of Hawaii, Kauai and the private island of Lanai. Meeting and incentive destinations abound in this tropical paradise. Each island is distinctly different from each other and boasts fabulous hotels and resorts, exquisite dining, breathtaking beaches, rain forests, waterfalls and plenty to do for any size group. 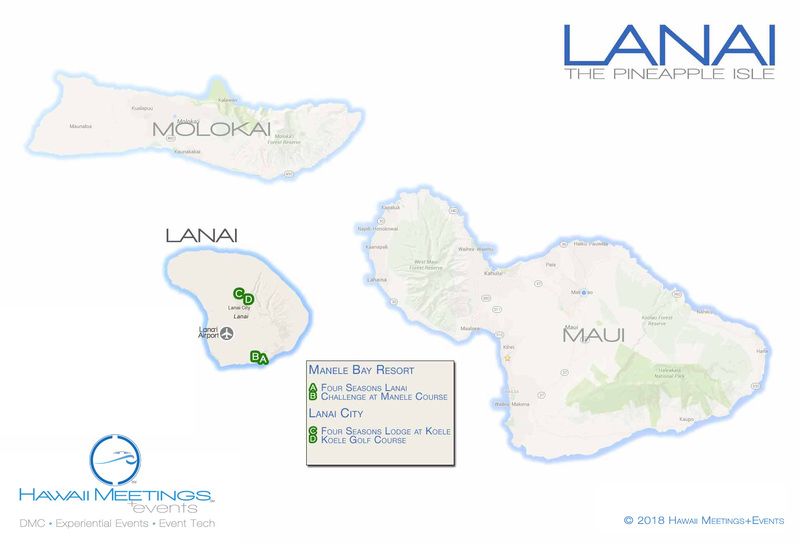 Scroll through the maps and direct links below to help you discover the best hotels and resorts on Lanai for your next incentive program or conference. Let us assist you in navigating the way through your destination and hotel site selection process. Call us at 808-244-7600, send us an email or submit a quick RFP. We’ll take very good care of you – quickly.